Chemical Inspection & Regulation Service Limited (CIRS) warmly welcom you to attend the 4th Summit Meeting on Chemical Regulations in China, Korea and Japan (SMCR 2014) on 15-16 October 2014 in Shanghai. The meeting focuses on chemical regulations and chemical safety management in Asia-pacific Region. Representatives from authorities, regulatory experts, industries heads will speak about opinions on regulatory updates, enforcement measures, and outlook of safety and sustainability of chemical industry in Asia-pacific region. Delegates can share information, communicate and exchange ideas on a global scale of chemical regulatory affairs. Now, the speakers and agenda of SMCR 2014 are confirmed. Several companies have registered already. Early subscribers can avail of a discount on the early subscription fee. We also welcome and invite companies and organizations to become co-sponsors and gain promotion privileges during the meeting. Don't miss this great opportunity to know more about chemical regulations, news, updates and trends in Asia-pacific region. Supervision of hazardous chemicals in Shanghai Free Trade Zone. 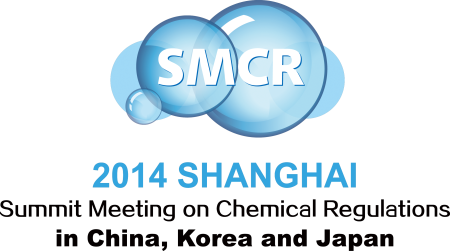 To view the full programme of SMCR 2014, please view the official website here. You can check the latest agenda, download the brochure or register online from our website.